“You know every time one of those things goes off, I feel as if I was helping to write the first chapter of a new Genesis." "Let's hope we don't find ourselves writing the last chapter of the old one." You might say that The Beast from 20,000 Fathoms was the cinematic A-bomb that awakened the giant monster on the big screen in the 1950s. By 1953, horror had shifted to the stuff of monsters, albeit in the form of alien invaders or proto-creature feature style leftovers from previous decades. However, when it debuted, Eugène Lourié’s film did so with a perfect fusion of imagination and blockbuster-style filmmaking that was fueled by atomic age paranoia. It was an unassuming film in many respects, but The Beast from 20,000 Fathoms helped to chart the immediate course for 50s horror, though its influence has managed to spread even further than that. The story is so familiar to us now, having been recycled dozens of times in the years since: a group of scientists are experimenting with nuclear technology, and a bomb test in the arctic awakens a prehistoric dinosaur-like creature that had been hibernating for millions of years. Tom Nesbitt (Paul Hubschmid) witnesses this resurrection, but no one believes him, even after newspaper headlines are dominated by reports of attacks by a mysterious sea serpent. With the help of a professor (Cecil Kellaway) and his assistant (Lee Hunter), Tom discerns that these attacks indicate that this beast is set to make landfall in New York City. The ensuing images that eventually endure from The Beast of 20,000 Fathoms are similarly familiar, particularly the hordes of panicked civilians fleeing in terror from a giant monster. It’s an image that would not only recur throughout the 50s but later on as well; not only is the film an obvious precursor to giant monster films (which would eventually be properly branded as kaiju films in later years), but it’s also an early example of spectacle filmmaking. Though it was filmed on a relatively small budget (even for 1953), The Beast from 20,000 Fathoms is a grand, pulpy popcorn film where the effects take the wheel. In this respect, it’s actually the logical update of the film that most immediately inspired it: King Kong, which had been recently re-released and reawakened the giant monster beast at the movies, as it were. This beast, however, was the first such creature that acted as some sort of karmic retribution for our nuclear sins, a notion that would be taken and expounded upon in its successors (most notably in 1954’s Gojira). The Beast from 20,000 Fathoms doesn’t exactly dwell on this as much as those films, but the general thrust--the awakening of the savage, prehistoric past to destroy our atomic present--is the seed whose fruit would flower several times over the next decade. As such, Beast is perhaps a film that’s remembered for its innovations more so than its quality, which might be a little unfair. Though it doesn’t quite aspire to the heights of Gojira, it’s difficult to deny the pulpy wizardry of the film. 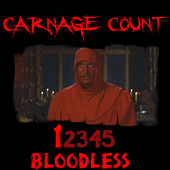 Even though it’s mostly populated by a bunch of B-actors (though look out for Lee Van Cleef as a corporal at one point!) who are saddled with typically stilted dialogue, the film is brisk and efficient; it might be in the shadow of Hiroshima, but it plays like a spirited monster movie very much out of the Kong mold at times. Disaster films to come--be they from Irwin Allen to Roland Emmerich--probably owe at least a little debt to The Beast from 20,000 Fathoms, which helped to define the formula of big and incredible sequences of stuff being destroyed, much to the contradicting delight and horror of audiences. We usually balk at films that are style over substance like this, but The Beast from 20,000 Fathoms is spectacularly well-realized and packed with numerous sequences that are still awe-inspiring thanks to Ray Harryhausen’s landmark effects sequences. The film not only represents a groundbreaking genre, but also groundbreaking effects work. Harryhausen never directed a film, but there are several movies that we might as well call “Harryhausen films” all the same, and this is the first proper one. 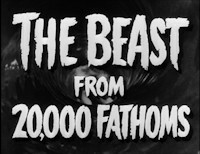 The now legendary effects man had already been working on Hollywood, but The Beast From 20,000 Fathoms was his first solo effort, and this didn’t stop him from stealing the show. The Rhedosaurus itself remains a definitive creature, as it’s deceptively inventive; it may look resemble a glorified tyrannosaurus at first glance, but there’s something almost dragon-like about its forked tongue and tail. The animation that brings it to life is still stunningly fluid and graceful as it stomps around New York, destroys a lighthouse, and even chomps down a police officer in one particularly horrifying scene. Many of Harryhausen’s most important innovations with foregrounds and backgrounds are at work here to create impressively seamless effects work. The aforementioned lighthouse scene is responsible for another famous name’s attachment to the project: the recently deceased Ray Bradbury, whose short story “The Fog Horn” featured a similar sequence. This resulted in Warner Brothers snapping up the rights to the story, thus securing Bradbury one of his first film credits without even breaking a sweat. The film’s actual screenplay, attributed on-screen to Lou Morheim and Fred Freiberger, solidly strings together the various effects sequences, and Lourié even manages some harrowing sequences (one involves a deep-sea dive) that are effective even without the monster’s presence. Lourié is obviously big on spectacle from the start--in fact, he doesn’t even bother with the typical technique of shrouding the monster early on, preferring instead to revel in Harryhausen’s masterful effects. The Beast from 20,000 Fathoms is maybe a little slight; it was an innovator, but, like many innovators, it was improved upon by later passes (especially Gojira). It’s definitely popcorn fare, albeit not one without a conscience or a sense of real style, and serves as evidence that well-done spectacle is a valid form of movie-making. This is a monster movie writ large--very large--and remains as one of the better examples of the genre that’s a must-see for obvious reasons. Warner Brothers has released it once by itself on DVD, where the presentation is solid if not a little properly grungy on the visual side (a reflection of the film’s low budget). Extra features include a interview with Harryhausen about designing the Rhedosarus, while another pairs him up with Bradbury, and the two long-time friends reminisce on their experiences. This disc has been repackaged with one of the film’s most immediate successors, Them!, plus that duo appeared on a TCM Classic Films Collection alongside World Without End and Satellite in the Sky. I’d recommend the latter package since it’s such a good value, plus The Beast from 20,000 Fathoms is worth the price of admission alone. As a convergence of talent and influence, the film is required viewing to properly contextualize its more famous and accomplished spawn. Buy it!